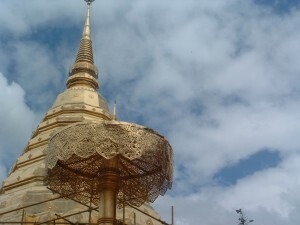 On Saturday 17th April 2010 we went with Suriya to the Mae Ping Elephant Camp in the Chiang Dao District. 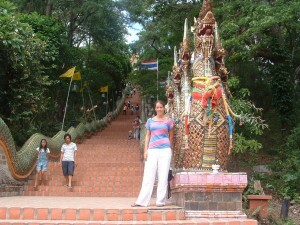 We paid for a multiple ticket for 1,200 Baht (£24). 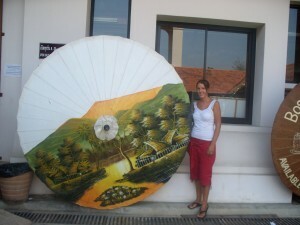 This included watching the Elephant show, riding the Elephants for 1 hour (around the camp and up the Mae Ping River), taking a ride on an Ox Cart and floating down the Mae Ping River on a bamboo raft for 45 minutes, finishing with a delicious Thai lunch at the Royal Ping Garden Resort. We would definitely recommend this package. The day ran so smoothly and everything was extremely enjoyable. We arrived in time for the last Elephant show which starts at 10 am, an earlier one starts at 8.30am. I would advise you to arrive early, as the show starts promptly. After buying your tickets you will get to watch the Elephants being washed in the Mae Ping River. From here they proceed to a demonstration area, where you will get to sit and watch the Elephants do various tricks and tasks. Such tricks include, carrying a sign that welcomes you to the show, kicking a football, painting and shooting a ball into a hoop. We were surprised to see how well the Elephants were trained. We didn’t realise an Elephant could be trained to do such tasks. Elephants are an important animal in Thailand. After watching the show, your guide will direct you to a high platform, where you will wait for your Elephant. Suriya managed to get us to the front of the queue. Once seated on the Elephant we started our trek around the Elephant Camp, which involved walking through the Mae Ping River, which was around 4 ft deep. The Mahout (Elephant driver) directs the Elephant by pressing behind the Elephants ears with his knees. He also carries an Elephant hook, which is only used if the Elephant misbehaves. The hook is inserted into the elephant’s sensitive skin, either slightly or more deeply, to cause pain and get him to behave in a certain manner. At times we would get quite close to a sheer drop and the mahout would have to direct him back. The scenery we passed was beautiful yet the ride was very bumpy. 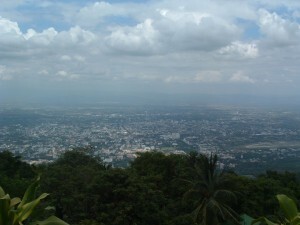 We passed by several tree top shops, where you can purchase food, such as sugar cane and bananas for your Elephant. Our Elephant kept grabbing the sugar cane with his trunk, demanding that we bought it for him. I didn’t want to mess with him! Elephants need a lot of food, this is not surprising, considering the size of them! 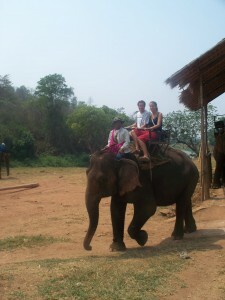 We really enjoyed the Elephant riding. I would of liked to experience sitting on his bare back, maybe next time. Next we took a short Ox-Cart ride. This took us round a circuit that went up and down hill. Shame this circuit was circular, as we ended up back where we started! The poor Oxen carrying us no where useful! The ride was very bumpy, especially when going down hill as the cart was pushing the Oxen. 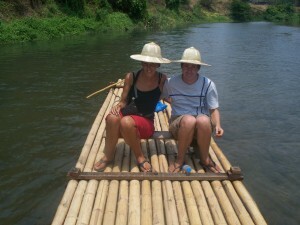 We then took a very peaceful ride on a Bamboo Raft, down the Mae Ping River. We were surprised at how steady and calm the Bamboo Raft was. You could easily fall asleep on it. The driver pushes the raft along using a long bamboo stick. It took around 45 minutes to get to the hotel resort, where we went for lunch. The service and food at the Royal Ping Garden Resort was of a very high standard. All food including water was included in the price of our ticket. If you require any other drinks, you may purchase them at an extra cost. 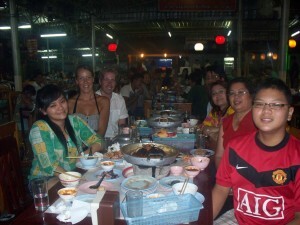 We were served rice, steamed vegetables, spring rolls and a tofu dish with a sweet and sour sauce. We were offered extra vegetables and rice. We were then served a fresh fruit salad. We were extremely satisfied with the food and service. The day ended around 2pm. We had an amazing time and would recommend this package to anyone! 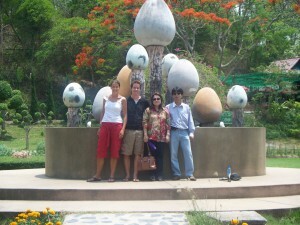 On the way back to Chiangmai we went to the Orchid and Butterfly park, which is free on entry, when going with a guide. Here you can see many types of Orchids and butterflies. This was small in comparison to other Orchid Gardens we have gone to. There is also a restaurant and souvenir shop, where you can buy various Orchids preserved with resin, which almost resemble glass.